Categories: Advice, Environment, Lifestyle & Consumer, Men, Women, Smart, Nea. 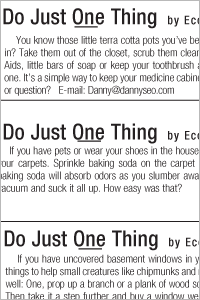 Do Just One Thing is a daily feature that shows how you can live an eco-friendly life that embraces style. The feature's creator, Danny Seo, has ingenious ways to live simply and affordably while doing something positive for the environment. Environmental lifestyle expert Danny Seo calls his eco-friendly way of living “Simply Green.” Through his best-selling books, television programs, products, magazine and syndicated newspaper column and his how-to lifestyle lectures, Danny Seo continues to share the creative ideas that have made him America’s leading lifestyle authority on modern, eco-friendly living. Born on Earth Day in 1977, Danny championed the natural biodiversity of our planet from a very young age. On his 12th birthday, he founded the organization Earth 2000 with just a few friends and $23. By his 18th birthday, he had transformed the grassroots organization into the country’s largest teenage activist charity, spearheading worldwide campaigns on behalf of the environment. Danny encourages America to live a greener lifestyle with great style. His first of eight lifestyle books, “Conscious Style Home” (St. Martin’s Press; 2001), chronicles his renovation of his parents’ home in Green Hills, Pa., using easy-to-find, eco-friendly materials. The beautifully photographed book received rave reviews in The New York Times, Elle, Food & Wine, Elle Decor and USA Today, which raved “Say ‘environment’ to Danny Seo, and it’s as if you’ve punched the word into the search engine Google: Out roars an avalanche of ideas and references that threatens to scramble your brain.” “Conscious Style Home” helped Danny become America’s favorite environmental lifestyle authority. Danny has given many keynote addresses around the world, including the State of the World Forums, The College of William & Mary and the commencement address to the graduating class of UC Berkley. 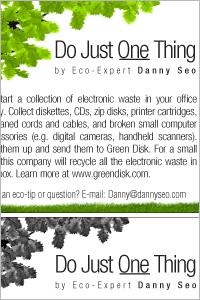 Danny’s creative how-to approach toward green living is the blueprint for Danny Seo Media Ventures, which includes a multi-platform portfolio of products, corporate partners and media properties all designed to help people “do just one thing” to help the world around us. The publishing segment includes eight books with over 1 million copies in print, including the best-selling “Upcycling” series of craft books and a nationally syndicated column, “Do Just One Thing,” distributed by Andrews McMeel Syndication. The television segment includes regular appearances on NBC’s “Today” show as a lifestyle contributor. Previous TV shows including HGTV’s “Red Hot & Green” and “Simply Green with Danny Seo.” Danny Seo Media Ventures has an extensive line of home, beauty and food products sold in over 4,000 stores North America. Products include bedding and bath, furniture, organic gourmet food, cookware and bakeware, decorative accessories, gardening equipment, lighting and more. These items can be found at stores like T.J. Maxx, Marshalls, HomeGoods, HomeSense, The Shopping Channel and HSN. More information can be found at dannyseo.com. Danny’s empire continues to grow. He recently launched a magazine, Naturally, Danny Seo; Danny Seo Philosophy organic wines; and Danny Seo Reserve Beauty. He is a brand ambassador with the Ford Motor co.
"I'm just one person. What can I do to help the environment?" 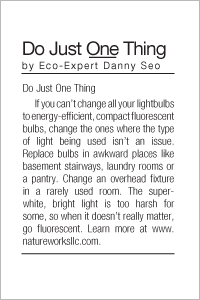 For eco-expert Danny Seo, the answer is simple: "Do Just One Thing." 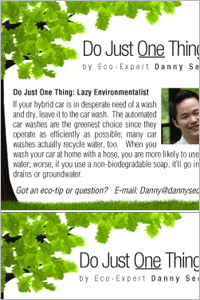 This daily feature, which offers Danny's simple, convenient tips on eco-friendly living, reminds readers that caring for the environment doesn't have to be expensive or complicated. Calling his environmental philosophy "simply green," Danny Seo has authored numerous best-sellers, become a popular lifestyle correspondent on CBS's "The Early Show," hosted specials on Fine Living and HGTV, and authored a monthly eco-living column for Better Home's and Gardens' 40 million readers. Danny's enthusiasm for the environment is infectious. His smart, eco-friendly ways to save the planet remind us that by doing just one thing, we are making our world a little greener and a lot better.